Warren Buffett, Jeff Bezos and Jamie Dimon have picked a leader for their health care venture. Buffett told CNBC on Thursday that the CEO will probably be announced within two weeks. "We have an outstanding individual," Dimon said. "Character, culture, capability, heart, mind, the whole thing." 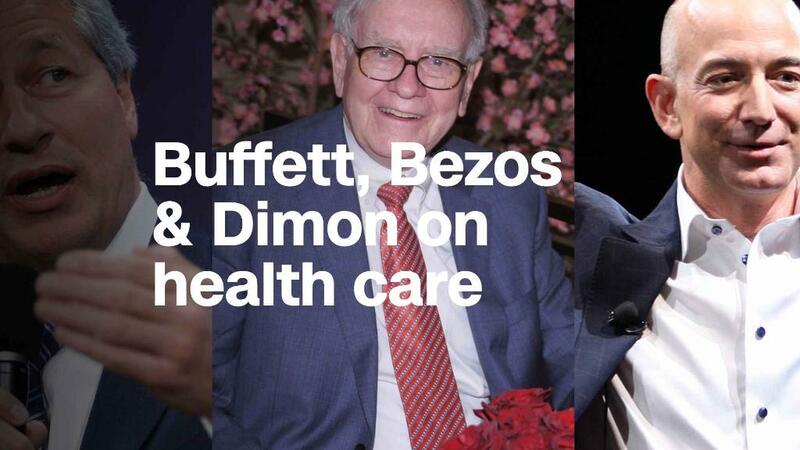 The three corporate leaders said in January that their companies — Berkshire Hathaway (BRKB), Amazon (AMZN) and JPMorgan Chase (JPM) — would work together to give their combined 840,000 employees better health care choices. The CEOs hope to bring down costs, both for their workers and their companies. They have not provided much detail on the venture, but the announcement alone was enough to spook health care and drug stocks. Buffett cautioned on Thursday that solutions won't be easy. He called health care "a very, very tough nut to crack, and it's going to take significant time." "There are a lot of things that can be done better," Dimon added. He mentioned fraud, administrative costs and overuse of certain drugs.